Otto Robert Frisch FRS (1 October 1904 – 22 September 1979) was an Austrian-British physicist. With his collaborator Rudolf Peierls he designed the first theoretical mechanism for the detonation of an atomic bomb in 1940. Frisch was Jewish, born in Vienna, Austria, in 1904, the son of Justinian Frisch, a painter, and Auguste Meitner Frisch, a concert pianist. He himself was talented at both but also shared his aunt Lise Meitner's love of physics and commenced a period of study at the University of Vienna, graduating in 1926 with some work on the effect of the newly discovered electron on salts. After some years working in relatively obscure laboratories in Germany, Frisch obtained a position in Hamburg under the Nobel Prize-winning scientist Otto Stern. Here he produced work on the diffraction of atoms (using crystal surfaces) and also proved that the magnetic moment of the proton was much larger than had been previously supposed. During the Christmas holiday in 1938 he visited his aunt Lise Meitner in Kungälv. While there she received the news that Otto Hahn and Fritz Strassmann in Berlin had discovered that the collision of a neutron with a uranium nucleus produced the element barium as one of its byproducts. Hahn, in a letter to Meitner, called this new reaction a "bursting" of the uranium nucleus. Frisch and Meitner hypothesized that the uranium nucleus had split in two, explained the process, estimated the energy released, and Frisch coined the term fission to describe it. Political restraints of the Nazi era forced the team of Hahn and that of Frisch and Meitner (both of whom were Jewish) to publish separately. Hahn's paper described the experiment and the finding of the barium byproduct. Meitner's and Frisch's paper explained the physics behind the phenomenon. Frisch went back to Copenhagen, where he was quickly able to isolate the fragments produced by fission reactions. As Frisch himself later recalls, a fundamental idea of the direct experimental proof of the nuclear fission was suggested to him by George Placzek. In the Summer of 1939 Frisch left Denmark for what he anticipated would be a short trip to Birmingham, but the outbreak of World War II precluded his return. 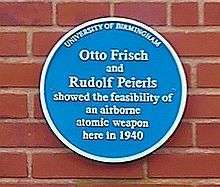 With war on his mind, he and the physicist Rudolf Peierls produced the Frisch–Peierls memorandum at Birmingham University, which was the first document to set out a process by which an atomic explosion could be generated. Their process would use separated Uranium-235, which would require a fairly small critical mass and could be made to achieve criticality using conventional explosives to create an immensely powerful detonation. The memorandum went on to predict the effects of such an explosion—from the initial blast to the resulting fallout. This memorandum was the basis of British work on building an atomic device (the Tube Alloys project) and also that of the Manhattan Project on which Frisch worked as part of the British delegation. Frisch and Rudolf Peierls worked together in the Physics Department at Birmingham University 1939–40. He went to America in 1943 having been hurriedly made a British citizen. He retired from the chair in 1972 as required by University regulations. He died in 1979. His son, Tony Frisch, is also a physicist. 1 2 3 Peierls, R. (1981). "Otto Robert Frisch. 1 October 1904 – 22 September 1979". Biographical Memoirs of Fellows of the Royal Society. 27: 283. doi:10.1098/rsbm.1981.0012. JSTOR 769874. ↑ Bethe, H. A.; Winter, George (January 1980). "Obituary: Otto Robert Frisch". Physics Today. 33 (1): 99–100. Bibcode:1980PhT....33a..99B. doi:10.1063/1.2913924. ↑ Frisch, Otto R.; Stern, Otto (1933). "Über die magnetische Ablenkung von Wasserstoffmolekülen und das magnetische Moment des Protons". Zeitschrift für Physik (in German). 85 (1–2): 4–16. Bibcode:1933ZPhy...85....4F. doi:10.1007/BF01330773. ↑ Hahn, O.; Strassmann, F. (1939). "Über den Nachweis und das Verhalten der bei der Bestrahlung des Urans mittels Neutronen entstehenden Erdalkalimetalle [On the detection and characteristics of the alkaline earth metals formed by irradiation of uranium without neutrons]". Naturwissenschaften (in German). 27 (1): 11–15. Bibcode:1939NW.....27...11H. doi:10.1007/BF01488241. The authors were identified as being at the Kaiser-Wilhelm-Institut für Chemie, Berlin-Dahlem. Received 22 December 1938. ↑ Meitner, Lise; Frisch, O. R. (1939). "Disintegration of Uranium by Neutrons: a New Type of Nuclear Reaction". Nature. 143 (3615): 239–240. Bibcode:1939Natur.143..239M. doi:10.1038/143239a0. The paper is dated 16 January 1939. Meitner is identified as being at the Physical Institute, Academy of Sciences, Stockholm. Frisch is identified as being at the Institute of Theoretical Physics, University of Copenhagen. ↑ Frisch, O. R. (1939). "Physical Evidence for the Division of Heavy Nuclei under Neutron Bombardment". Nature. 143 (3616): 276–276. Bibcode:1939Natur.143..276F. doi:10.1038/143276a0. The paper is dated 17 January 1939. [The experiment for this letter to the editor was conducted on 13 January 1939; see Rhodes, Richard (1986). The Making of the Atomic Bomb. Simon and Schuster. pp. 263 and 268. ↑ Otto R. Frisch, "The Discovery of Fission – How It All Began", Physics Today, V20, N11, pp. 43-48 (1967). ↑ J. A. Wheeler, "Mechanism of Fission", Physics Today V20, N11, pp. 49-52 (1967). ↑ Rhodes, Richard (1986). The Making of the Atomic Bomb. Simon and Schuster. pp. 612–613. 1 2 3 Frisch, Otto Robert (1980). What Little I Remember. Cambridge University Press. pp. 161–162. ISBN 9780521280105. an unusual assembly ... no reflecting material ... For obvious reasons we called it the Lady Godiva assembly. ↑ Rhodes, Richard (1986). The Making of the Atomic Bomb. Simon and Schuster. pp. 610–11.